Small numbers of red squirrels are to be trapped and relocated to new areas under a plan to boost numbers of the mammal in Scotland. Trees for Life and the Highland Foundation for Wildlife hope to introduce the native species to 10 locations. They said squirrels would be "collected" from healthy populations in Moray and around Inverness. The 10 relocation sites have still to be confirmed. Red squirrels face threats from habitat loss and non-native grey squirrels which compete with them for food and can pass on diseases. Conservationist Roy Dennis is involved in the new Caledonian Forest Wildlife Project. 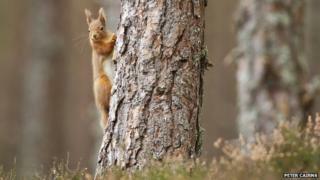 In 2008, he led an effort to move 40 red squirrels into woodlands at Dundonnell in Wester Ross. That population has since grown to 400 squirrels. The new project has secured a grant of more than £61,000 from the Heritage Lottery Fund. Alan Watson Featherstone, of Trees for Life, said: "Through an effective and proven approach, this exciting initiative will help red squirrels return to the forests where they belong for the first time in decades - leading to significant new populations of this iconic species and offering real hope for its long-term survival. "Increasing red squirrel numbers will also benefit our native forests and the many species that depend on them, because red squirrels are nature's tree planters. "They collect and bury thousands of tree seeds each autumn, but frequently forget these hoards - which in spring take root and so expand our woodlands."